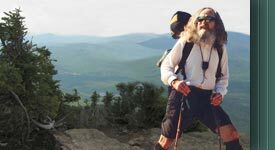 There's not a long-distance trail in existence today (including the Appalachian National Scenic Trail) that, for the long-distance thru-hiker, doesn't involve some roadwalking. So, for those of us who choose this way--comes sooner or later (usually sooner) the matter of dealing with this reality. Unfortunately, and where exist literally volumes of how-to articles, tutorials, and books covering hiking and backpacking along and through the "green tunnel," (recreational long trails through the forest), little has been written, instructional at least, dealing with taking to the open road. Further, and to compound this problem considerably, does there exist today many roadwalk routes, created by our conscientious trail builders, that are touted to be the safest way, when in reality they are likely the least safe. "How could this be?" you might ask. Well, problem is, there�s a flaw in current thinking, an almost universal one, in the minds of those who "designate" the highways and byways we thru-hikers are to trek in order to interconnect isolated segments of off-road trails. So, first, permit me to discuss this error, which most-all our trail builders make. Their rule (which is totally backward as to my thinking, my longtime experience) is to select roads bearing the least traffic (distance be damned, seems). Straightforward logic, right? Unfortunately though, and for those of us who must endure, it's flawed logic. Now, don't be too quick to doubt what I'm about to say, as it's backed by years and years (and countless thousands of miles) of roadwalking--and I'm still here, not totally unscathed, but I'm here. Okay, so here goes: The safest roads to hike are heavily-traveled interstate highways (roll eyes now). The next safest, divided four-lane federal and state highways. And the next (not always, but usually), two-lane federal and state highways. The least safe are less-traveled county paved and gravel secondary roads, the roads most often chosen by our trail organizations (their designers/builders) because there's supposedly less traffic. To further support their choices (when questioned) will oft' be stated something to the effect: "This route is more serene and scenic." Convincing? Sure! However, cutting to the chase, I�ve often countered this with: "Are we thru-hikers out here hammering the unnecessary road miles to take in the scenery along your long and protracted backroads, or are we simply trying to get from one section of trail to the next?" And, I may mention additionally: "I don't ever recall seeing a single one of your scoutmasters out here with their troop--hiking your "serene and scenic road sections?" 1. Visibility - How far down this road can we see at any given time; what�s the unobstructed viewing distance? Are there blind curves, blind top-outs? In my experience, I�ve found these visibility hazards all too common along paved and gravel county/secondary backroads. 2. Road surface - Gravel roads are not necessarily unsafe. Vehicles coming at us from around blind curves, over blind top-outs, they do tend to make more racket in the gravel, giving us a heads-up. In our state and national forests, service roads are commonly gravel at best, or likely, unimproved two-track. These roads are seldom a problem. However, we must be ever alert to the increased number of ORV yāhoos that frequent and rip around in these public sanctuaries. 3. Shoulder/emergency lane - This is one of the most important concerns relative to safety. If we find it necessary to hike the traffic side of the white line or the left-hand groove of the three-track gravel road, in order to get in our daily miles (due to badly rutted, extreme off-slope, or no shoulder), then look out! Unfortunately, this hazard (poor or no shoulder) is not the least uncommon along designated "safe" roadwalk routes. 4. Road striping - This brings into question the safety of non-paved and un-striped paved county roads. Trekking roads that have no striping, no white or yellow lines (which control vehicle travel to a great extent) are much more dangerous. Believe me, when trekking such roadways, look out! These are often the backroads chosen and much used by our trail builders. Okay, here's why striping is important: The solid white line that separates the shoulder/emergency lane from the traffic lane creates a barrier between us and the oncoming traffic, albeit, a soft barrier. [You are hiking facing oncoming traffic, aren't you? Duh! Hey, we've got enough to worry about without risking getting run over from behind (walking with traffic).] We'll get more into the how-to of protecting our blind side in a moment. First, here's a very good rule to follow: Stay away from the traffic side of the white line. Ah, and what are rules for if not to be broken! Oh well, and however, I routinely and regularly break this rule--and continue getting away with it. Here's how to minimize the risk (of this risky business): If we're dealing with a road having poor shoulders (with moderate-to-little traffic), we can hike directly on the white line with little additional risk (a bit of kindness to our feet, too, when the asphalt is bubbling). We must be constantly alert to oncoming traffic, of course, and the need to protect our blind side--traffic coming at us from behind. Here's where the importance of the solid yellow center lines come in (no passing zones). We must keep a constant eye on the center striping. If there�s a solid yellow line right of center, good. If there�s none, look out. If there are two solid yellow lines, either side of center, still good. If there are none, again, look out! Remember me talking about the yāhoos that scream the forest service roads? Well, they're out here on our highways too. And they'll pass, with us right there, without hesitating a second in jamming their left rearview mirror into our right shoulder blade. Learned this lesson a long time ago, the hard way--got knocked clean into the ditch--blind-sided by one of these inconsiderate yāhoos! Fortunately, I only suffered some very bad bruises. The guy never even slowed down. So, be ever watchful--what's going on behind. And sure it's hard to look back. We've got to stop or significantly break our stride. But, hear something going on back there [You don't have your ear-buds in, do you?] --hang a left pronto, stop, and look! Now, does the higher degree of safety availed us while trekking divided highway start to make some sense? 5. Traffic � (See the order of importance!) Heavy traffic coming at us, breakneck speed can sure enough become hypnotizing and mind-numbing, and under such circumstances, dangerous. Especially so, the frightening roar of eighteen-wheelers flying toward us at eighty, though they are pros at what they do--and to the man/woman, are courteous to a fault. Occasionally, the less-safe road route (bearing less traffic) is shorter, but that pleasant circumstance is rare, indeed. Usually it's much longer, often taking the weary long-distance thru-hiker clear out into the back forty, that no-man's-land, from there to follow a totally unsafe round-about way back, while keeping us longer in harm�s way--just to avoid the heavier traffic. Such can make for a very discouraging and un-fun day, especially when there's a safer (in the traffic, wide shoulder, striped surface), more direct route to the next section of trail. Keep in mind that the overwhelming majority of trail builders are just that, trail builders, having never done a thru-hike, and having no idea how the quality (say JOY) of our long trek is being degraded by their frequent, ill-conceived roadwalk route. Keep in mind, also, (and when pressed, the trail builders will tell us) that their roadwalk routes are in no way official, just "suggested/recommended" routes. It's their CYA way out, in case we get run over! And please, folks, those of you who work our long trails, who volunteer, who give of your precious time and immeasurable talent, please know that there�s not another soul out here who appreciates you more than this old intrepid. What I�ve said here is meant to be constructive. We all want to trek our way--safely. Finally, and no doubt about it--when we take to the open road, we take on considerable additional risk, no matter the road design, no matter the traffic, no matter the moment of circumstance. Accepting this risk can never be discounted, certainly never the least bit glorified. However, what inevitably happens with time--trekking the highways and byways, do we become enamored and less tuned to this constant risk. You see folks, for this old intrepid, traveling by foot across this great nation--such has simply turned into and become a daily routine, a very joy-filled, rewarding, way of life. Below is a safety rating table to help support/clarify the tutorial.